When you're looking for an everyday carry knife, you want a tool that's going to hold up. You want a knife that stays sharp, that's strong, and that can easily be used in whatever hand you have free. Something simple, yet elegant, that you can depend on to get the job done. 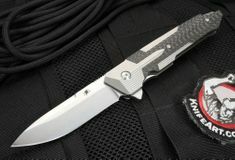 Then the Kranos Spartan blade has everything you're looking for, and then some. Designed for everyday use, and built to last for the long-haul, the Kranos knife has everything you could ask for from your pocket blade. 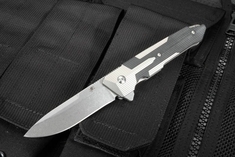 Made in America from CPM S35VN steel, the blade itself is 3 3/8 inches long, giving the entire knife a length of 8 3/8 inches when it's been opened. Despite that length, though, the knife weighs in at only 4.3 ounces. The handle is made from aerospace-grade titanium, as well, which ensures it will last at least as long as the blade does (if not longer). The grip on the handle is made from black carbon fiber, which will ensure a long-lasting, comfortable hold. For those who are just as concerned with aesthetics as they are with the practical, the Kranos is a small work of art. Hearkening back to the days of ancient Sparta, it's all straightforward lines and interlocking angles with clean edges. the fact that such things provide a strong grip, and marry function to form, just makes it all the more attractive. 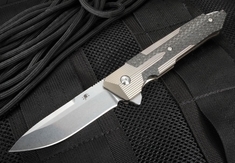 The handle will either be classic, leaving the titanium to shine and contrast with the black carbon fiber, or the metal will be blue anodized for a softer effect that does nothing to take away from the blade's inherent function, or appearance.